The State Library of Ohio is pleased to announce the website launch for Ohio Digital Network, Ohio’s service hub for the Digital Public Library of America (DPLA). Ohiodigitalnetwork.org collates resources and vital information for Ohio libraries, museums, and archives working to expand access to their digital collections by making them accessible to the world. A step-by-step guide for getting started, a metadata manual and metadata application profile document and video, copyright determination tools and rights statements, and links to other copyright resources are featured on the new website. A statewide map and a list of links to all contributing institutions provides opportunities for networking and shared experiential learning for Ohio’s cultural heritage institutions. “Ohiodigitalnetwork.org enhances the work of the Ohio Digital Network (ODN) to encourage and support Ohio’s libraries and cultural heritage institutions in their efforts to make their unique digital collections more broadly accessible,” expressed State Librarian Beverly Cain. Ohio Digital Network (ODN) builds on strong digital collection efforts across the state, including Ohio Memory and the Ohio Digitization Hubs project. As a part of DPLA, students and teachers, researchers, and history buffs can explore rich collections from across the state in one place alongside millions of resources from the growing DPLA network of partners. The DPLA website currently provides access to over 99,000 items in digital collections from 14 contributing institutions in Ohio. Ohiodigitalnetwork.org was created for current and potential contributing institutions by 427 Design, a visual design and communications strategy company located in Akron, Ohio. “Working with 427 was a valuable experience for us—they asked us all the right questions to crystallize what we needed in a site, all while making the effort to learn exactly what makes libraries and managers of digital collections tick,” explained Jen Johnson, library consultant and ODN coordinator for the State Library. 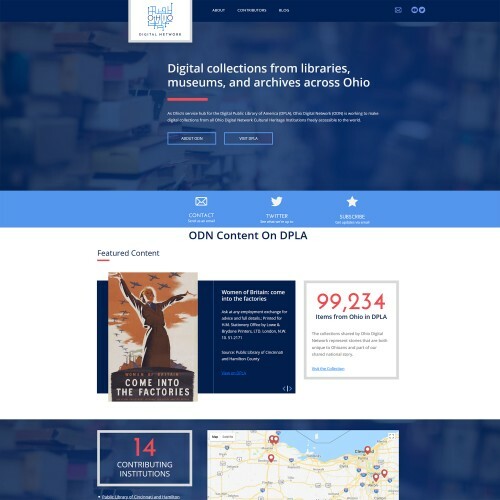 The launch of Ohiodigitalnetwork.org marks another major milestone for ODN and follows its March 2018 DPLA debut with collections from eleven Ohio institutions. “The ODN website will give us a local platform to highlight Ohio’s items in DPLA but also serve as a resource center for institutions working to contribute their materials. We hope that this site will attract and support institutions all across Ohio, and communicate the value of participation in DPLA,” said Johnson. The Ohio Digital Network is a project of the State Library of Ohio in partnership with Ohio Library and Information Network (OhioLINK), Ohio Public Library Information Network (OPLIN), and Ohio History Connection. The State Library is one of the eleven Ohio libraries and cultural institutions members with collections in the initial launch of the Ohio Digital Network. Ohiodigitalnetwork.org was funded by a grant from the John S. and James L. Knight Foundation, with support from DPLA. The work of Ohio Digital Network is generously supported in part by LSTA funds awarded to the State Library by the Institute of Museum and Library Services and OPLIN. DPLA connects people to the riches held within America’s libraries, archives, museums, and other cultural heritage institutions. All of the materials found through DPLA—photographs, books, maps, news footage, oral histories, personal letters, museum objects, artwork, government documents, and so much more—are free and immediately available in digital format. The cultural institutions participating in DPLA represent the richness and diversity of America itself, from the smallest local history museum to our nation’s largest cultural institutions. The core work includes bringing new collections and partners into DPLA, building our technology, and managing projects that further our mission through curation, education, and community building. DPLA launched in April 2013 as the result of a multi-year grassroots planning initiative involving thousands of volunteers dedicated to the vision of building a national digital library for all. Established in 1817, the State Library of Ohio is a state agency that serves state government and all types of libraries. The vision for the State Library is a Smarter Ohio where every Ohioan can access the necessary resources to be engaged citizens, excel at their jobs, participate in the workforce, and pursue their passions and interests. The State Library of Ohio ensures a smarter Ohio by managing the delivery of services through three channels: directly, by building and managing quality collections and providing hands-on service to state government; cooperatively, through collaborative efforts and information sharing networks within the library community; and virtually, through online and on-the-go access to expert assistance, digitized resources, and a vast selection of electronic materials. The Ohio Public Library Information Network (OPLIN) provides broadband Internet connections and related information services to Ohio public libraries. Their primary mission is to ensure that all Ohio residents have fast, free public Internet access through the 251 independent local public library systems in Ohio, as well as the use of high-quality research databases not freely available on the World Wide Web. Though the eventual consumers of their services are often members of the general public, their actual customers are in fact limited to the public library systems of Ohio. Established in 1992, the Ohio Library and Information Network (OhioLINK) is Ohio’s statewide academic library consortium­­ and serves more than 600,000 end users, with 120 libraries as full members. These libraries are distributed among 92 different Ohio colleges and universities. OhioLINK membership includes the State Library of Ohio, 16 public university libraries, 50 independent college libraries, 23 two-year college libraries, 16 regional campus libraries, 8 law school libraries, and 5 medical school libraries. A member of the Ohio Technology Consortium of the Ohio Department of Higher Education, OhioLINK provides a competitive advantage for Ohio’s higher education community by cooperatively and cost-effectively acquiring, providing access to and preserving an expanding array of print and digital resources, and by centrally hosting digital content. The Ohio History Connection is a statewide history organization with the mission to spark discovery of Ohio’s stories. Embrace the present, share the past and transform the future. As a nonprofit organization chartered in 1885, the Ohio History Connection carries out history services for Ohio and its citizens focused on preserving and sharing the state’s history. This includes housing the state historic preservation office, the official state archives, local history office and managing more than 50 sites and museums across Ohio. Established in 2000, Ohio Memory is the collaborative statewide digital library program of the Ohio History Connection and the State Library of Ohio. On this free website, you can explore digital content from over 360 cultural heritage institutions representing all 88 of Ohio’s counties!